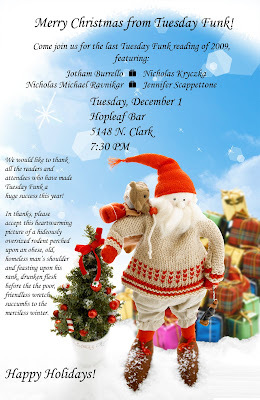 Please join us on Tuesday, December 1st for the final Tuesday Funk of 2009. Upstairs room opens 6:30 PM. JOTHAM BURRELLO is an adjunct faculty member at Columbia College Chicago where he directs the publishing lab, a resource for emerging writers. His writing has appeared in Eleven Eleven, Drunken Boat, Oyez Review, Pennsylvania English, the Christian Science Monitor, and elsewhere. He recently completed his novel, Fall River. He's a former editor of the journal Sport Literate. His multimedia company, Elephant Rock Productions published the anthology All Hands On, The 2nd Hand Reader, and produced instructional DVDs for writers featuring Janet Burroway, Robert Olen Butler, Joe Meno, Rosellen Brown and others. He lives in Chicago with his wife and two little boys. A North Side native, NICK KRYCZKA is a schoolteacher in the Chicago Public Schools and a graduate student in History at Northeastern Illinois University. Aside from the obligatory writing of lecture notes for his eager high school pupils and the drafting of thesis papers on obscure moments in nineteenth century American history, Nick has hunched over countless keyboards in third world internet cafes to cobble together accounts of his summertime treks through the remote corners of four continents. NICHOLAS MICHAEL RAVNIKAR (BA, University of Wisconsin; MFA, Naropa University) lives in Racine, WI,Jo B where he edits the irregularly published webzine, The Bathroom and is organizing with Nick Demske the first annual Racquetball Chapbook Tournament. His writing has appeared in most recently in Otoliths and Boo: A Journal of Terrific Things and is forthcoming in BlazeVOX and unarmed. His first feature-length documentary, Quilts on Barns: The Beauty of Rural Art, wrapped post-production in August 2009 and will be available for free viewing online soon. He's currently working on a documentary titled SMALL PRESS, MIDWEST. Midwest-affiliated writers, publishers, readers and scholars interested in letting him interview them for that project can send an email to nicholasmichaelravnikar@gmail.com. He has facilitated workshops in poetry, video, installation art and journalism in a variety of settings, most recently in conjunction with the Racine Arts Council and Woodland Pattern. JENNIFER SCAPPETTONE, a translator, poet, and purveyor of visual stills and prose, is the author of From Dame Quickly (Litmus Press, 2009), and of several chapbooks. She is now at work on Exit 43 -- an archaeology of the landfill and opera of pop-ups--for the cross-genre publishing project Atelos Press. Excerpts of that book appear in Belladonna Elders Series #5: Poetry, Landscape, Apocalypse featuring pop-ups and prose by Scappettone, a lyric sequence by Etel Adnan, and an essay by Lyn Hejinian (Belladonna, 2009); pop-up scores are now being adapted for performance in collaboration with choreographer Kathy Westwater as LAND. She was guest editor of the feature section of Aufgabe 7, devoted to contemporary Italian experimental poetry, and is at work on a range of translations from Italian, with a focus on the "Babeling deeply felt" of the postwar polyglot author Amelia Rosselli. A selection of Neosuprematist Webtexts, filmed stills, was installed at Infusoria, an exhibit of visual poetry curated by Helen White for the Festival Le Off in Brussels and Het Zilverhof in Ghent in 2009. A range of readings, a talk on poetry and landscape, and a podcast dialogue with Al Filreis are available for download at her PennSound author page. She is an assistant professor at the University of Chicago.